Ya know, there are some days where not much seems interesting news wise, even when digging deep. Probably doesn’t help that my Giants are playing the Cowgirls later this afternoon. Not much in the global warming or illegal immigration realms, the media doesn’t really want to talk about the successes in Iraq, and, football is on. The President of the United States arrives in the Middle East saying he’s trying to make peace one more time. At home, in a week of big political news, the story fights for airtime. But in the Middle East, on the growing galaxy of state and independent television channels, it was “all Bush, all the time.” And, depending what you were watching, you could have been forgiven for wondering if what you were seeing was the same event. If beauty is in the eye of the beholder, so is news. 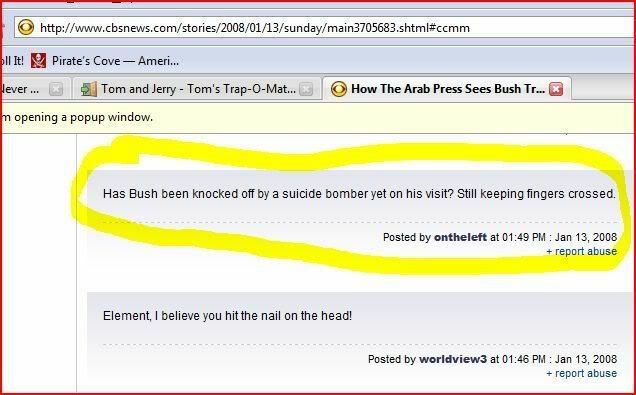 What better way to bash Bush then to “blame” it on the Arab media? Within the Palestinian Territories, it was reported either as a push for statehood … or a cover-up for oppression. And if you were watching Syrian TV as President Bush arrived in Israel, you could even have been confused as to where exactly he was. inventagod – Bu$h had the Navy begin his visit with his own Iran Fastboat video. Faux News is not a new idea to Bu$hCo and the NeoCons. The world is used to the USA promoting war and death, and held it”s breath for a few days until the Navy sham exposed itself for what it was. A war criminal within the meaning of the term as defined is searching for peace. What a whole lot of ***. Check your pulse if you believe the man. It is not being cynical, it is reality. The man is a war-monger and an irresponsible piece of work. He had the unique opportunity to bring about peace and the support of friends all over the world after 9/11, but squandered if for personal gains and for the gains of those who put him in power. How sad and tragic. If there really is such thing as JUSTICE AND ACCOUNTABILITY and that NO MAN IS ABOVE THE LAW, he and the many likes of him would have been charged for crimes against humanity and war profiteering. Nothing good will come out from the lives of such men and women. What goes around comes around. worldview3 – We actually have christian schools right here in our country that teach the children to die for their religion. samt66 – BUSH is not religious, he is a war profiteer and oil puppet for the extreme right wing. He has perfected the technique on how to manipulate christians and religious fanatics”In the USA” to believe his cause and McCain is the one assigned to continue on, he is BUSH 3rd term..For a true change in the WH, we need to pick on of these two – OBAMA or Ron Paul. watcher269 – It is Shameful when you have to watch Al Jazeera to get any REAL News in America! It is also Shameful that the United States is Run by Barney Fife and Goober the VP.Does it not make you PROUD that our country is run by a D+ student?Does it not make you Proud that Cheney and Bushit were Draft Dogers and AWOL”ers? Does it Make you Proud that Bush is pushing America into a recession and devaluing the Dollar soo much that America is being sold to the middle east – the Terrorists we are supposed to be FIGHTING? It is time to boycott Oil – don”t buy gas for one day – What if America did not buy any gas for 1 day? What would that say to Corporate America? Get Ready to be ENRON”d real soon. Mark my words. Bend over for your ENRON – its coming – just remember to smile and say – Thank You.